The following fill in the blanks come from Minnesota-based quartet, Hippo Campus. The band consists of high school friends, Nathan Stocker (guitar), Whistler Allen (drums), Jake Luppen (guitar, lead vocals), and Zach Sutton (bass) though they typically go by the names Stitches, Beans, Turntan, and Espo. 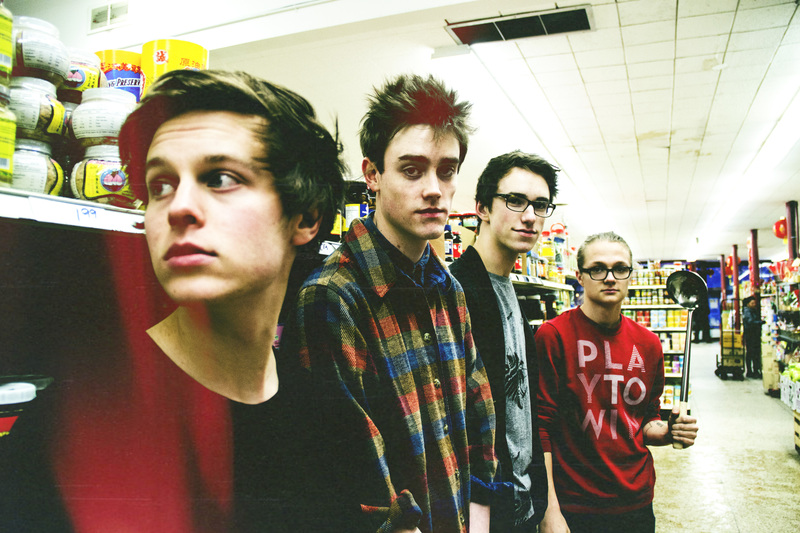 Hippo Campus formed in 2013 and released their debut EP, Bashful Creatures, in November of the following year. My favorite tracks from the record include “Sophie So” and “Little Grace.” Hippo Campus will be performing at Cleveland’s Grog Shop on August 12th and their new EP South is set to be released on October 2nd. Learn more about the band from their responses and be sure to check out their music before the show. Three words we’d use to describe us are…. We’re bad at counting. The story/meaning behind our name Hippo Campus is….Located in the medial temporal lobe of the brain, the hippocampus has to do with memory or something. It was the least worst name we were fortunate enough to stumble upon in psychology class. We met each other….We attended the same performing arts high school. After being in separate bands throughout those 4 years, we started making music together the summer after graduation. The pickiest eater is….Beans, but Espo is a vegetarian, so…it’s debatable. The most OCD member is….Stitches. For fun we like to….play Smash 64, go biking, paint towns red, eat food, hot tub. We’re currently listening to….Tame Impala, Keeps, Kendrick Lamar, Beach House, OG Maco, Gallant, The Helio Sequence, This Will Destroy You, Sales. Our favorite 90s jams include….anything from Genesis, and that one Enya song. Our favorite tracks to play live are….songs we didn’t write. One thing we want you to remember while listening to our music is….we’re winging it. Bashful Creatures was recorded in….two days at the beautiful Pachyderm studio in Cannon Falls, Minnesota. Something we learned from creating the EP was….expect the unexpected. Something odd we want our fans to know about us is…. We’re members of a strictly non-motorized bicycle gang, terrorizing the streets of Minneapolis that nobody resides on. We’re absolutely terrified of….not being liked. Our last meals would be….Chipotle, Phô, and Mochi. In the next six months you should expect….A new EP and a change in the weather. This entry was posted in Fill In The Blank, Interviews, Uncategorized and tagged band interview, Bashful Creatures, fill in the blank interview, fill in the blanks, hippo campus, Hippo Campus band, Hippo campus interview, Hippo Campus music, interview, pop, pop interview, pop music, south, Suicide Saturday. Bookmark the permalink.